Appetite by Random House, 9780147530776, 192pp. From the writer and recipe developer behind eat. live. travel. write comes a new cookbook for parents, children and Francophiles of all ages. Forget the fuss and bring simple, delicious French dishes to your home kitchen with Mardi Michels as your guide. Twice a week during the school year, you'll find Mardi Michels--French teacher and the well-known blogger behind eat. live. travel. write--directing up to a dozen children in her school's science lab as they slice, dice, mix, knead and, most importantly, taste. Whether they're learning to make an authentic ratatouille tian or tackling quiche made with pastry from scratch, Mardi's students can accomplish just about anything in the kitchen once they put their minds to it. In her first book, Mardi shows that French food doesn't have to be complicated. The result is an elegant, approachable cookbook featuring recipes tailored for young chefs and their families. From savory dishes like Omelettes, Croque-Monsieurs or Steak Frites to sweet treats like Profiteroles, Madeleines or Crème Brûlée, readers will find many French classics here. With helpful timetables to plan out baking projects, as well as tips on how to get kids involved in the cooking, this book breaks down any preconceived notion that French cuisine is too fancy or too difficult for kids to master. With Mardi's warm, empowering and encouraging instructions, kids of all ages will be begging to help out in the kitchen every day of the week. 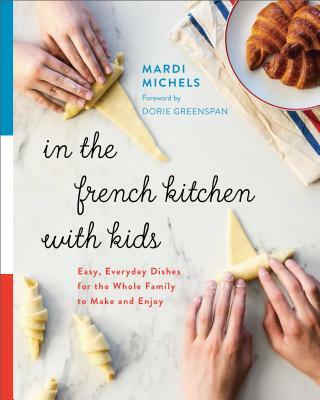 MARDI MICHELS is a full-time French teacher to elementary school-aged boys and the author of eat. live. travel. write--a blog focusing on culinary adventures near and far. As part of her job, she runs cooking classes for boys aged 7 to 14, called Les Petits Chefs and Cooking Basics. Mardi grew up in Australia, lived and taught in Paris for over five years and now calls Toronto home. In 2014, Mardi and her husband purchased a historic home in southwest France, which they operate as a vacation rental property. Mardi is also a Food Revolution Ambassador and in her spare time teaches French cooking and baking classes.